CAUTION: Android SMS is a native service that allows you to receive Short Message Service(SMS) messages on your device and send messages to other phone numbers. Standard carrier rates may apply.This services requires the IFTTT app for Android. 1. Connect Android SMS service. Search Android SMS service and click the icon. 2. Create applet for SMS service. Click this icon and search maker and click Maker icon. Click the area marked orange rectangle. Enter event name and click Create trigger button. Click that icon and search sms and click Android SMS icon. Enter phone number and click Create Action button. 3. Send a SMS message. Click the icon marked orange rectangle. With a web browser, visit the link above. Enter event name and click Test it button. Confirm that a SMS message is received in android phone. 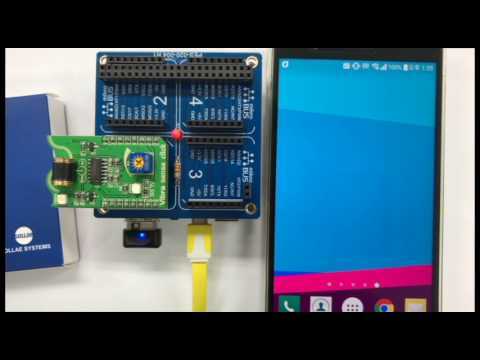 PHPoC Blue runs trigger when mikroBUS Vibra sense detects vibration. The video clip is modified to hide private and unnecessary information. In the video clip, near 6 seconds, a SMS message is received in the android phone. Replace YOUR_KEY with your actual key of Maker service. Last edited by Jack Kim; 01-10-2018, 03:06 PM. All times are GMT+9. This page was generated at 05:36 AM.